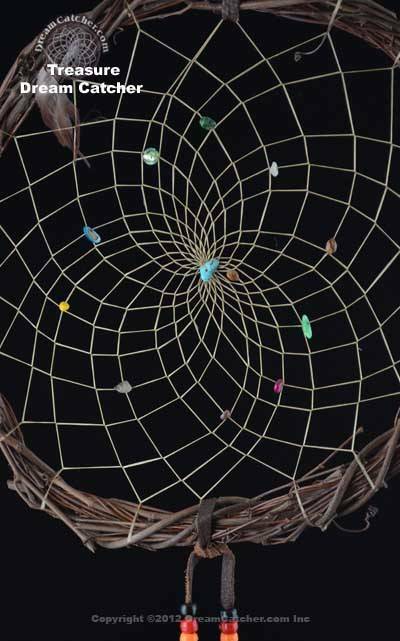 This wonderful natural dream catcher is made by Navajo / Dine` artist S. Yellowhair. This 18 inch diameter dream catcher is hand crafted out of vine and the webbing is adorned with an assortment of stones such as turquoise, hematite, red jasper, juniper berries and other beads that are used to attract the bad dreams. This Authentic Native American Made Dream Catcher that comes with a Certificate of Authenticity. The size of the hoop may vary slightly due to natural variations in the materials used and the leather may differ slightly in shade due to the dying and tanning process. The feather color and size and the bead color will differ from piece to piece as the artist makes each piece unique. If you want specific color beads or themed (lighter colors versus dark colors or pink versus blue etc.. ) please let us know in the order comment section. You may also call us to place your order and we will hand pick the dream catcher that matches your taste in colors. Otherwise we will pick a dream catcher for you. Due to the size of this piece extra shipping costs may be required. We will contact you if they are different than that quoted at checkout.